Before there were store bought medicines, our ancestors knew which plants grew around them and how to use them to remedy their ailments. 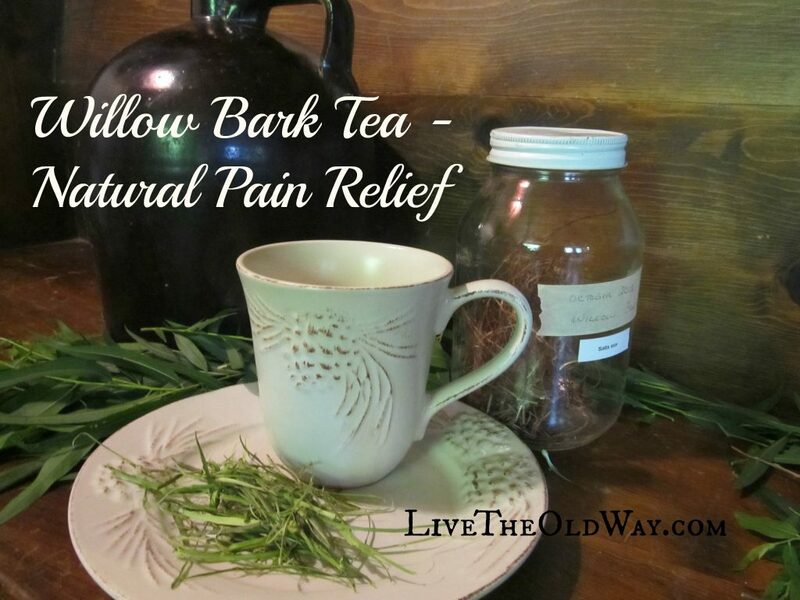 One big example of this is Willow Bark, which can be used for many types of pain including headaches, menstrual discomfort, muscle pain and arthritis. 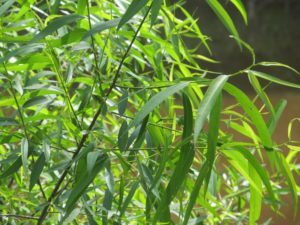 The active ingredient, salicin, found in the bark of Willow trees, also acts as an anti-inflammatory and is present in varying amounts in a variety of Willow trees. White Willow (Salix alba) has the greatest concentration of salicin but what we have on our property is just a run-of-the-mill swamp variety known as Black Willow (salix nigra) that grows heartily around our pond and in the wet areas upstream. Even though ours isn’t “the” one everyone hails as the source of willow bark extract, we still find great results using it. Like aspirin, consuming too much willow bark can result in gastric ulcers and will also thin blood in the same manner as aspirin, so employ common sense as you would with any medicine. Willow is easy to recognize and to my knowledge, there are no species that are unsafe to use, they will just have varying degrees of effectiveness. 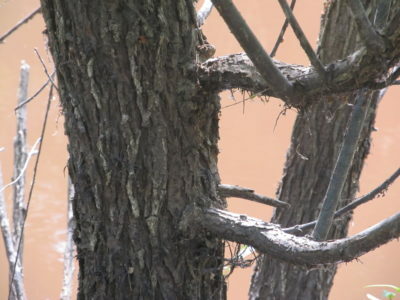 When making your willow I.D., look for the ragged, grey bark of the main trunk, it’s quite distinctive. 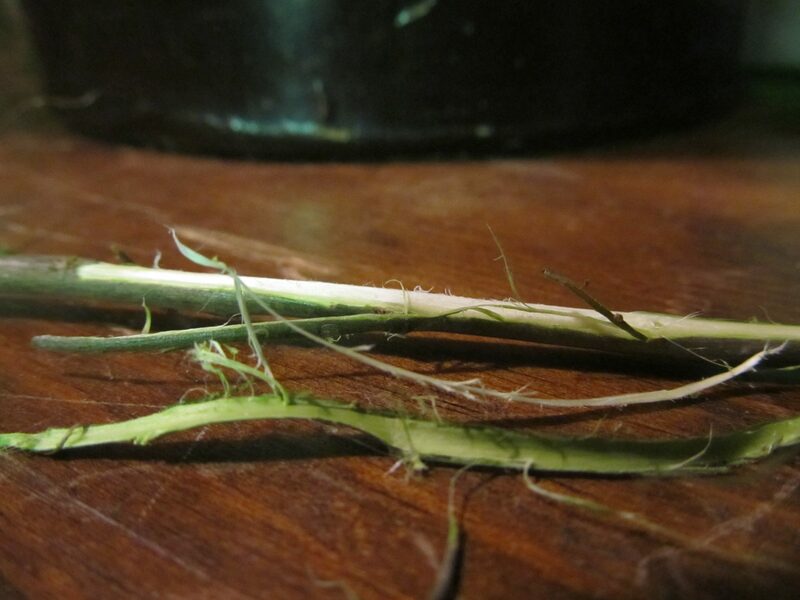 The leaves will be alternately arranged, long and thin with tapered points and finely toothed margins. If you’re unsure and you don’t have someone that knows willows to assist you with identification, a Peterson’s Field Guide is a great help. If you have the right environment and space, you can also purchase a tree from a reputable nursery and be certain you know what you have and be ensured to always have a supply of “nature’s aspirin”. We have done that with several medicinal plants that grow in our area, but we weren’t lucky enough to have on our property already. 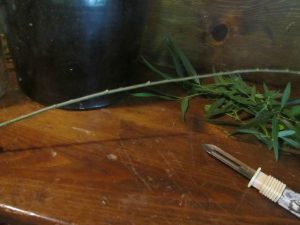 Whichever avenue you take, wild or planted, once you have located your willow, harvesting the bark is easy with the aid of an ordinary vegetable peeler. 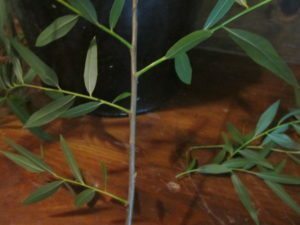 The part that you want to use is the inner bark that has a greenish tint, so with just a couple of swipes of a peeler, you can shave off exactly what you need with nominal effort… which is good because chances are, if you are making yourself a cup of willow bark tea, you probably don’t feel well already! Choose willow branches that are woody and brown. New growth will still have a green exterior and need to mature a bit to have sufficient levels of salicin. 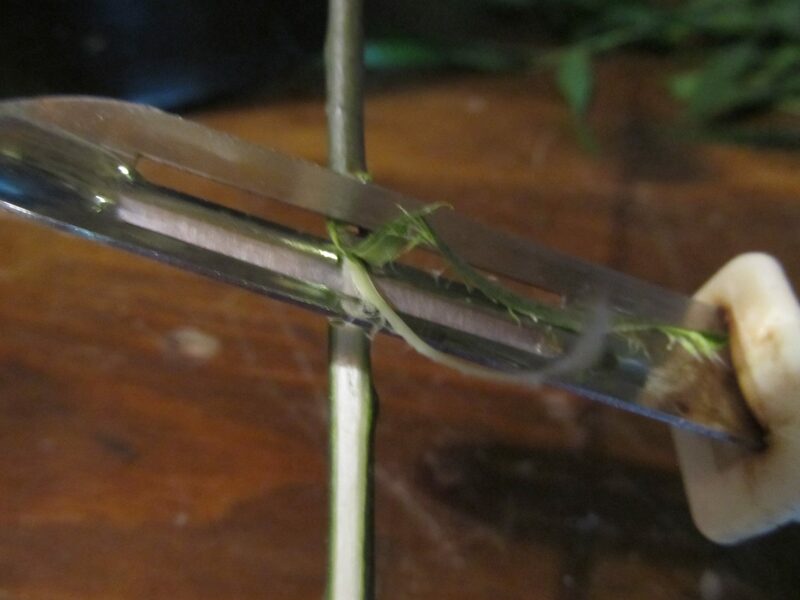 Remove the leaves and small twigs from the main branch you plan to peel. 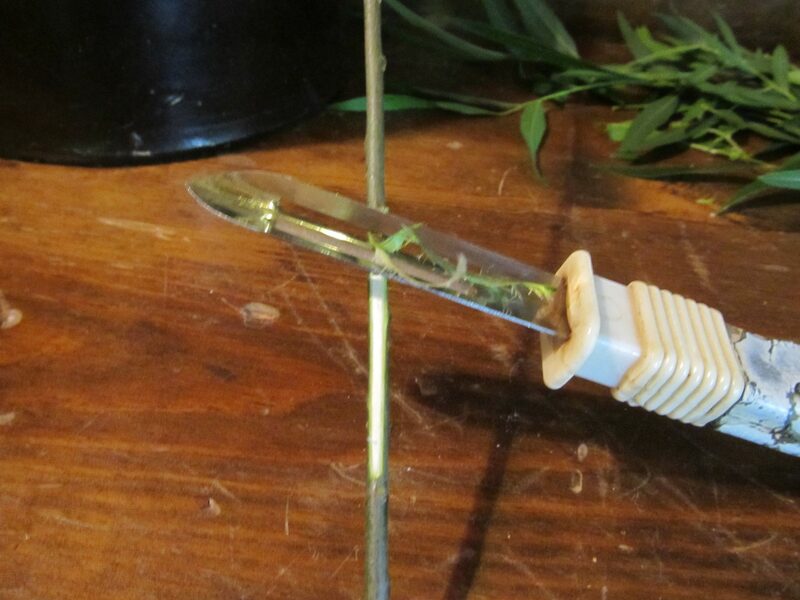 Use the vegetable peeler to strip off the bark and inner layer containing salicin. Once you have your bark shavings, they can be used immediately or dried on a wire rack, out of direct sunlight, and stored in a lidded jar like any other herb. The amount you use will depend on the variety of willow that you are using, but a good starting place is a palm-sized portion of shavings to one measured cup of hot water. 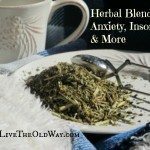 By far, the best method is to make it as an infusion, where you let it sit in a covered mason jar for at least 4 hours, but that is often impractical if you’re trying to soothe a headache, backache, etc. Steeping it as a tea is the way to go then, even if it isn’t as potent. While very palatable, the bark infusion or tea will have a detectible, somewhat biting taste like aspirin, but that is easily covered up with the addition of honey, lemon, ginger, etc. Some herbalists dry the bark and then powder it so that it may be taken in capsule form, but I prefer tea. It’s just a personal preference. If you dry it as described above, you can certainly powder it and measure it into Empty Pill Capsules . They even make a tray to hold multiple capsules that makes assembling them really easy. 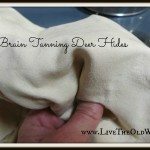 Those can be purchased through Mountain Rose Herbs or on Amazon Here . 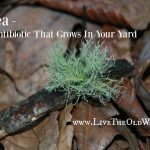 Nature’s aspirin – willow bark, an essential for homesteading and survival. Great Post! I always like learning ways I can use nature. 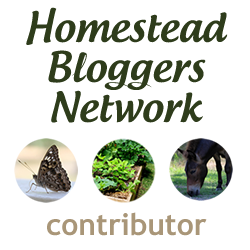 Your post has been featured in our Blog Hop #27 at essentialhomestead.com.